Within the often overwhelmingly bustling passageways, reached via vibrant graffiti tunnels, VAULT Festival’s performance spaces feel starkly subdued in contrast. The dark, dingy - and in this case slightly flooded – venues are situated in the arches underneath Waterloo station. Lit predominantly by stage lighting of choice, the festival’s rustic fringe spaces really force your concentration in one direction. This set-up works in the favour of a playwright like Acquah, whose work soars when language is at the forefront of attention. i stopped…when takes place during a fictitious slam poetry competition, in which three young poets battle for the crown. As the three initially take to the stage for round one, we are presented with accounts from their personal experiences, told through sharp and enthralling poetry. Sections of poetry are interwoven with backstage episodes from the three performers and the competition’s MC, and as the on-stage poetry digs deep into topics of race and relationships, the characters’ exploration of these issues continue in their behind-the-scenes interactions. The strength of this piece is rooted confidently in the striking poetic passages, which display Acquah’s talent for creating seamless yet powerful spoken word poetry and monologues. Acquah possesses both an alluring command of language as well as progressive and insightful consideration of the issues at hand. These episodes of poetry are supported by the potency of the characters - particularly the two female characters – who are generally well written and impeccably executed. Lauren La Rocque enchantingly embodies the naivety of young poet, Adele, while Acquah herself carries with ease the brazen attitude of activist, Naya. While the slam poetry event is effectively woven between the backstage episodes, often mirroring themes for an extended examination, these intermittent scenes do fall flat in comparison to the punchy poetry. Moments of weaker and more clichéd dialogue lead to a slightly unconvincing love story, which risks caricaturing these otherwise credible individuals. The play, however, culminates on a high with one final poetry reading that underpins the importance of the piece and its implications, while delivering the significance of its title, i stopped…when, and allowing the poets to reclaim their identities, for which they have fought so hard both internally and with those around them. Unfortunately, this run of i stopped…when has finished, but you can follow Acquah&Co on Twitter to stay in the loop with what's next. 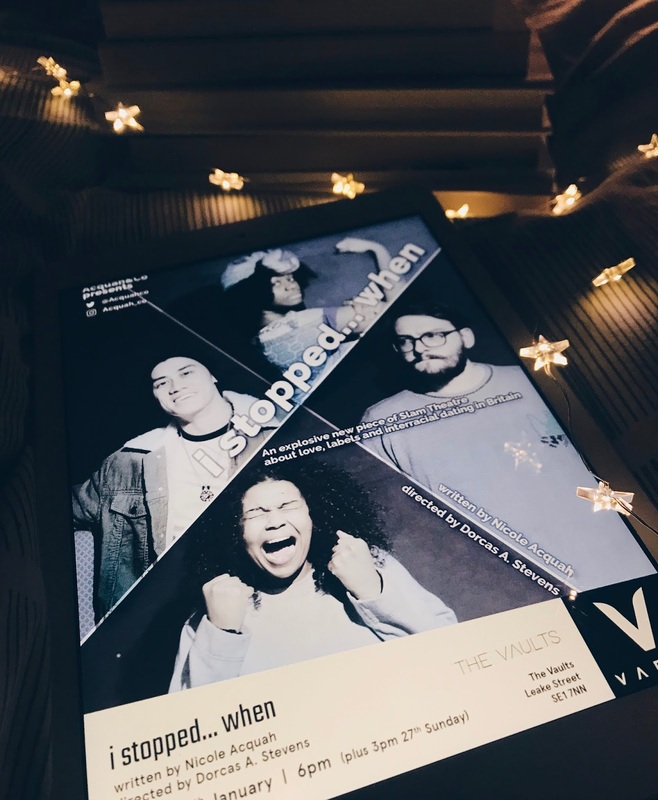 VAULT Festival 2019 continues until March 17.